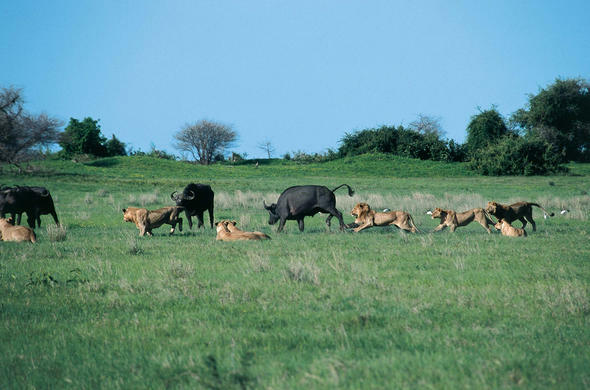 Unforgettable safaris are the ones where you have your camera ready to capture the drama. 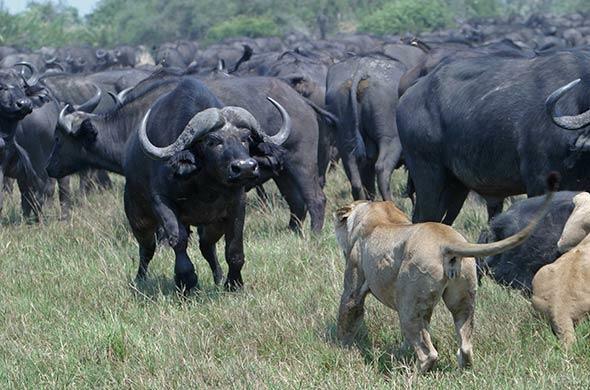 Here two of Africa's most dangerous Big Five confront each other on the grassy plains of Linyanti Many wilderness areas in Africa exhibit unique animal behaviour, depending on location and environment but nowhere can animals show such unique adaptations to environment as in Botswana's Okavango Delta. In an environment as unique as the Okavango Delta animals need to adapt to the changing of the seasons in more radical ways than animals of other wilderness areas. In order to survive the fluctuations of the seasons the denizens of the Okavango need to be adept at negotiating the flooded plains and constantly changing channels. With the arrival of the floodwaters the floodplains fill and what was once grassland becomes marsh and as the floodwaters generally arrive during the dry months the grazing is limited for a while until the water grasses begin to grow. There are animals that are supposedly afraid of water, but in the Okavango a fear of water is potential for disaster. 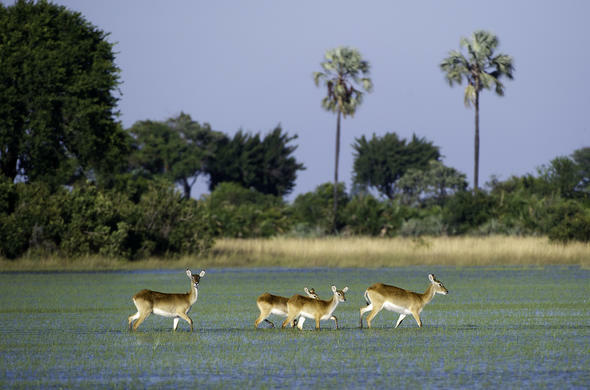 At any time of the day or night animals can be seen wading across the shallow floodplains. Predators stalk through water and prey flees across swollen floodplains. The water on the floodplains is generally not very deep, even at the peak of the flood, and even smaller species are able to wade across the water to islands. 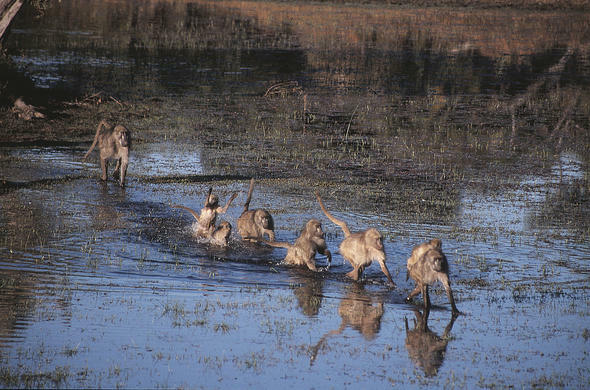 One of the most memorable experiences in the Okavango has to be watching a troop of baboons crossing a channel or floodplain. The chaos in the lead up to the first one taking a plunge is uncannily human, as is the individuality of each baboons crossing. Some cross the water screaming in fearwhilst others simply get up on their hind legs and able across. Others dither before taking the plunge. Visitors to any of the camps in the Okavango Delta will be able to experience some of the fascinating adaptations of the creatures that inhabit this unique eco-system.